In the US, this week marks the beginning of holiday travel season with Wednesday, shaping up to be the busiest travel day of the year. For many, this may be the only time this year that they will travel by air, and for some, it will be their very first time in the sky. For novice and veteran fliers, there are many things that can ruin your trip, from missed connections and lost baggage to having some of your carry on items confiscated by airport security. Please review the following pieces of advice, you may find something that will help you avoid problems, or help you deal with them should they happen to you. Assume that getting to the airport, parking, going through check in, and going through security lines will take longer than usual. Arrive early, and do what you can to avoid delays. If you are only taking carry-on bags, print out your boarding pass before getting to the airport and go straight to the security gate. A day or two before your trip, check with your airline to see if your flight's schedule has changed. If you can, sign up for phone, email, or text messaging alerts from your airline to find out about any last minute changes to your schedule. Keep your cell phone with you and have the airline's customer service or reservations number handy just in case you run into problems and have to call the airline directly. In the US, the Transportation Security Administration (TSA) requires travelers over the age of 18 to have some sort of photo identification issued by a state, local, or national government agency. This would include driver's licenses, passports, and military ID cards but would not include student ID cards or employee ID badges. If you do not have these kinds of IDs, you may be able to present alternative documentation to the TSA. Non-US/Canadian citizens are not required to carry their passports if they have documents issued by the U.S. government such as Permanent Resident Cards. Those who do not should be carrying their passports for domestic US travel. Depending on the level of security in place when you are at the airport, the security agents may insist on searching every bag, package, and suitcase. Be prepared by arriving at the airport at least a half hour earlier than usual. There are exceptions for small amounts of gels, liquids, and aerosols, and more generous exceptions for medically related items, but for most items, if you can pour it, pump it, squeeze it, spread it, smear it, spray it, or or spill it, you probably can't take it with you. Visit AirSafe.com to find out what you are not allowed to take on an airplane. If you are traveling to or from the US, you should make sure that you don't run into problems with duty free liquids like alcohol, perfume, and cosmetics. AirSafe.com provides detailed advice on how to deal with these kinds of duty free items. If you carry gifts, either in checked or carry-on baggage, make sure they are unwrapped. TSA has to be able to inspect any package and would have to unwrap a gift to do so. You can ship wrapped gifts ahead of time or wait until you arrive at your destination to wrap them. 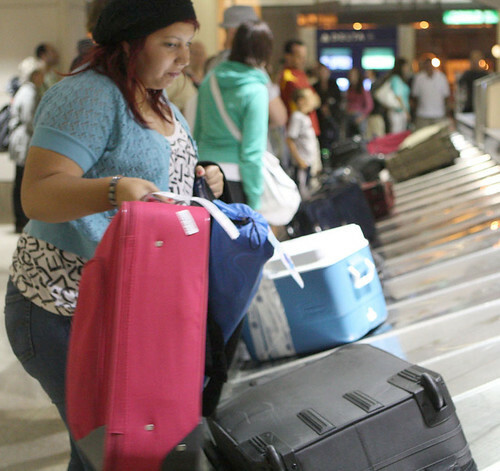 There are three baggage issues that become important during the holidays. The first is that most US airlines are charging you for every checked bag, so using carry-ons only will save you some money. Second, if you do check one or more bags, be prepared to deal with a lost, stolen, or damaged bag. That means if it is valuable to you and you can't deal with having it lost or stolen, keep it with you on your person or in your carry-on bag. That includes things like money, jewelry, medicine, passports, eyeglasses, and laptop computers. The third potential problem is that if there is no space in the overhead bins, you may be forced to have your carry-on bag checked. If this happens, be prepared to take out any valuables from your carry on before a cabin crew member or a gate agent takes it away. I liked that you suggest having the unaccompanied minor carry a copy of all contact information. One issue I run into is illegible handwriting on the form we use that stays with the child. This form is filled out by hand by the guardian of the child when they present the unaccompanied minor for the flight. Although the agent who accepts the child and inputs the information in to the computer should check for legibility, this is often not done. Flight attendants don't have access to any information on the company's computer system while on board the aircraft, so we must try to make out poor hand writing in the event we must contact the adult listed. It seems like a minor issue. But when you are on board an aircraft we must be able to effectively utilize the few resources we have. Also, as you mentioned, cell phones for unaccompanied minors are a very good idea. I don't have any problem contacting an adult for an unaccompanied minor from my cell phone in the event of a delay. However, this might be more than some flight attendants are willing to do. It also opens the flight attendant up to sharing personal phone contact information with a stranger that some flight attendants might not be comfortable with that. A child with a properly charged cell phone and contact information can be very helpful. This often helps to calm the nerves of the child's parent or guardian and the child because of the separation. A quick chat on the phone with a responsible adult representative of the airline who is on board the child's flight can make all the difference when it comes to peace of mind. I have heard the relief in many parents and grandparents voices. What You Are Not Allowed to Take on an Airplane.